We all love photographing beautiful sunrises and sunsets. When everything comes together—the correct camera settings, the light, the composition, the foreground subject, the background, the mood and the all-important clouds—we get a near-perfect in-camera photograph. Of course, there are times when our photographs need a bit of workin’ and playin’ in the digital darkroom. In this Quick Fix column, I’ll share with you some quick tips for improving, and perhaps saving, some of your sunrise and sunset photographs. To illustrate, I’ll use a photograph that I took of the Camargue horses on my July 2015 Provence photo workshop. Before we get going with enhancements, here’s an important sunrise and sunset tip: Generally, the more interesting the foreground, the more interesting the photograph. 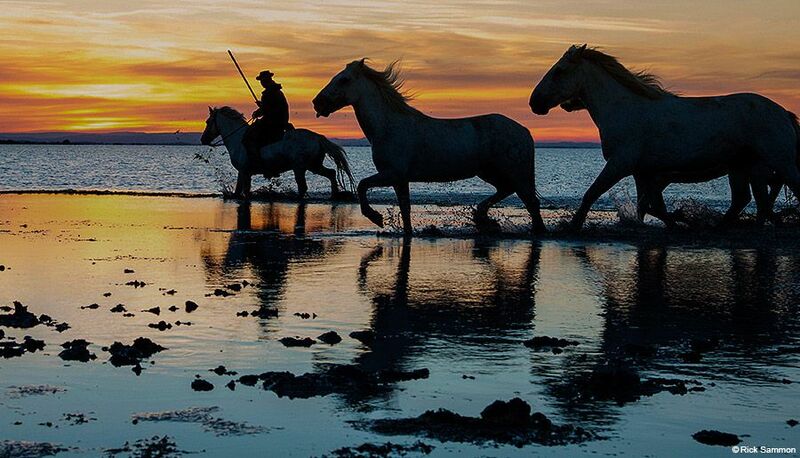 Imagine this scene without the horses—a nice enough image, but one that lacks impact. Here’s the original file from which I created the image for this column. Due to a slip of my exposure compensation wheel while helping a workshop participant, my photograph is several stops overexposed. Not a good thing, but not the end of the world, thanks to a few quick fixes. The first step in the quick fix was to crop and straighten the image. When I teach a photo workshop, I stress the importance of cropping because cropping gives us a second chance at composition. In cropping my photograph, I was careful not to crop out the reflection of the horses and the rider at the bottom of the image. Next, I used the Camera Raw filter in Photoshop (the same adjustments that are available in Adobe Camera Raw and Lightroom) to fix and enhance my overexposed image. • Reduced the Exposure to bring back detail in the sky. • Increased the Contrast for a stronger silhouette. • Reduced the Highlights to bring back some of the highlights in the sky. • Reduced the White to preserve some of the detail in the sky. • Increased the Clarity for a sharper photograph. • Increased the Vibrance for a more vibrant image. • Increased the Saturation for a more colorful image. As a final step, I added an orange graduated filter in Nik Color Efex Pro (a plug-in in the Nik Collection by Google) to add some color to the sky. As you can see, the digital darkroom provides some very powerful tools for saving and enhancing our images.